ADX Series, Extreme Duty - This SMART Series Phase Converter is manufactured by American Rotary and will convert 1 to 3 Phase power and provide 100% power for 208-250v equipment. All units are UL/CUL Listed. The ADX series phase converters have current control to provide consistent torque while starting high inertia, extremely hard starting loads, yet are precise enough for CNC applications. Best for: High Inertia/friction loads such as pumps, fans, compressors, blowers, dust collectors and fly wheels. 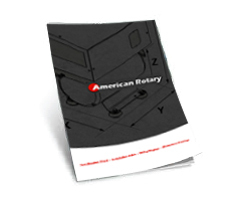 American Rotary engineers the entire phase converter system to provide optimum performance. Our variable impedance generator (VIT) and MicroSmart controller combine to make the most powerful and precise rotary phase converter on the market. Stable Voltage & Sinewaves 3-phase motors just don't cut it when it comes to Phase Converters. The VIT Induction Generator, by design, balances poweer factor and phase angles which ultimately lead to true, undistorted sinewaves and more stable voltages. Engineered to perform. CTR (Current Transient Reactor) along with the MicroSmart controller allows high currents to be drawn through the phase converter (for high torque) while maintaining voltage and power. Programmable Smart Controller provides precise control of the phase converter. Digital control provides better voltage balance, prolonged life of the converter, significantly more load starting capacity (ADX), and several failsafe features only available in the American Rotary's Smart Series Phase Converters. See our Entire Shop List!